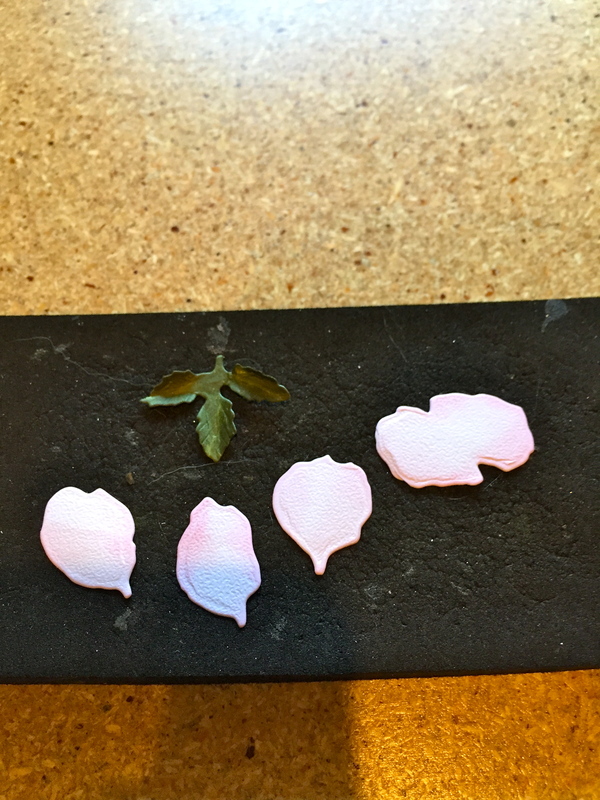 In my latest release, I decided to revamp some of the old favorites and improve upon the technique and size to make them more compatible to my other flowers. Rose 3 is one of those improvements. You can always refer to my YouTube video on Rose 2, for basic techniques (i.e., shaping, pinching, bending, etc. 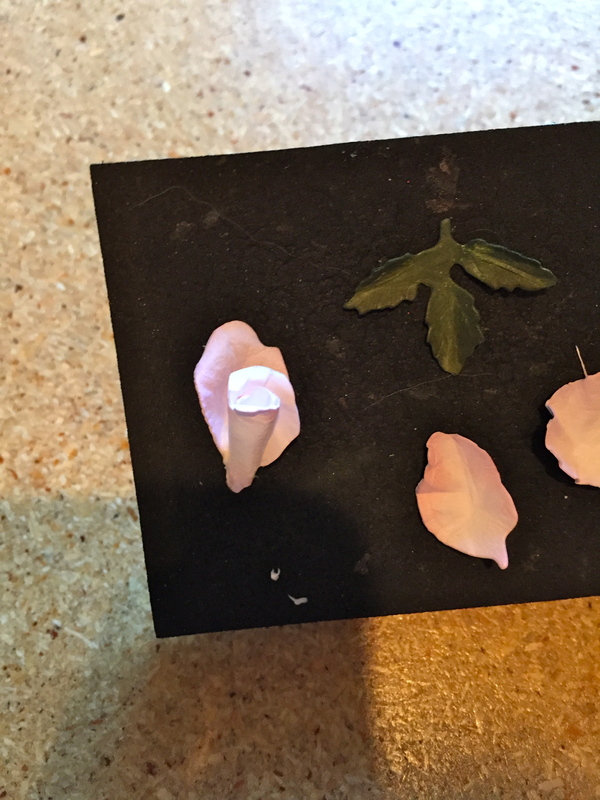 ), but until I do a new video, I’ve stepped out how I make this Rose and even a bud. 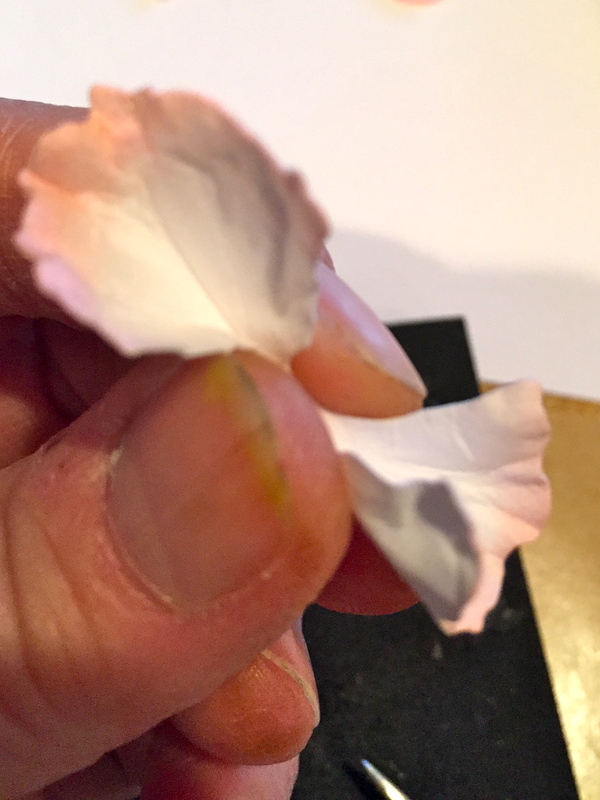 As you will see, it sets next to another new die, Garden Notes Fairy~Rose Petal. Check out all the new releases at Elizabeth Craft Designs…there’s some pretty amazing designs. 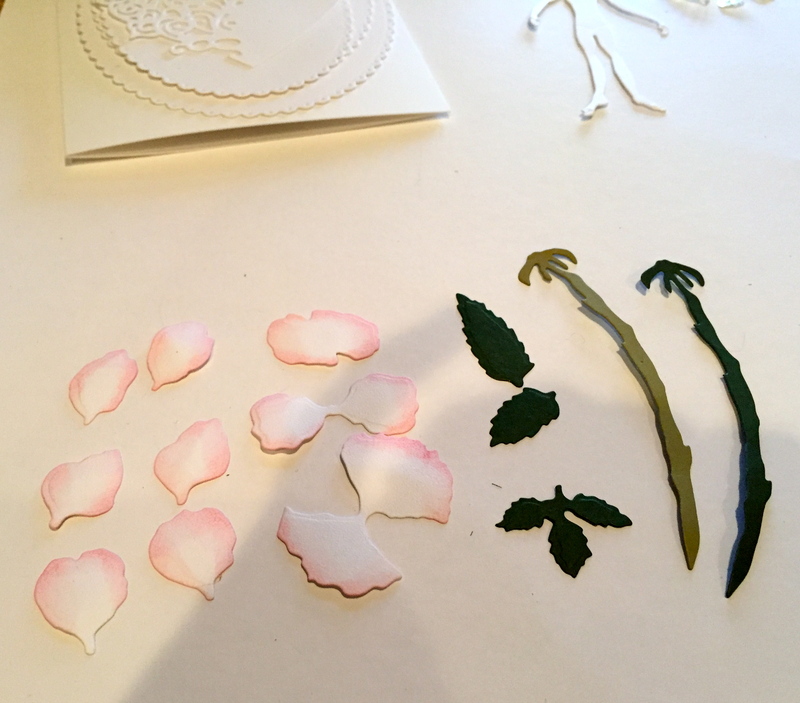 The die set includes everything you to create the flower. 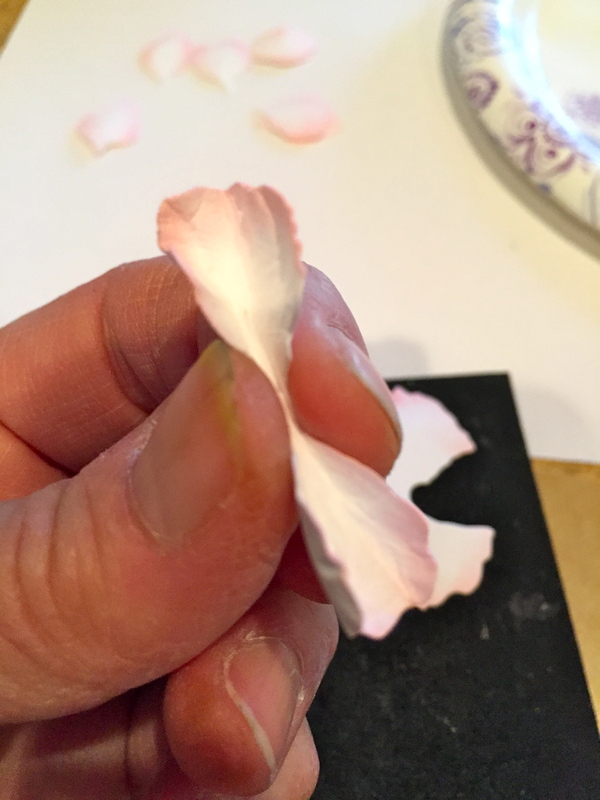 I chose to die cut the petals from Soft Finish 85 lb. 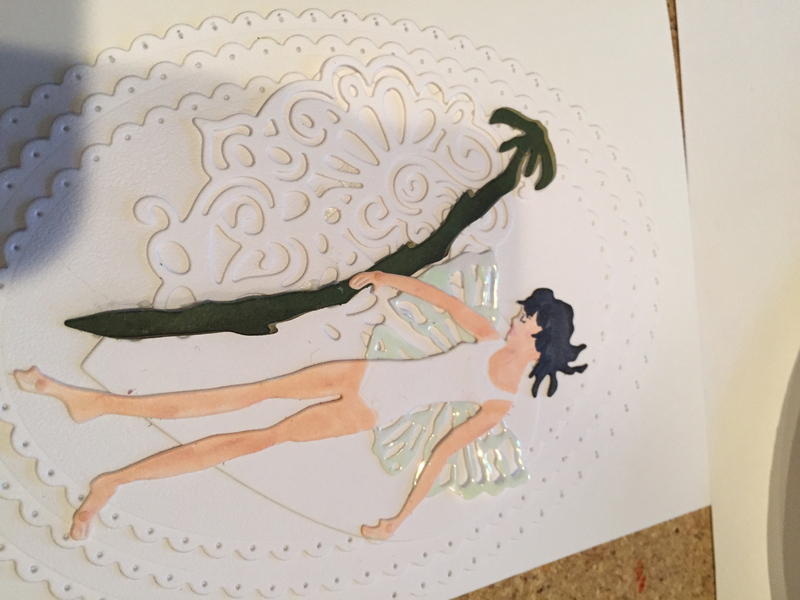 card stock and shade the ends with Distress Ink/Spun Sugar. You will notice there are two stems cut and that is because I like to “double up” on the stem to give it some dimension. 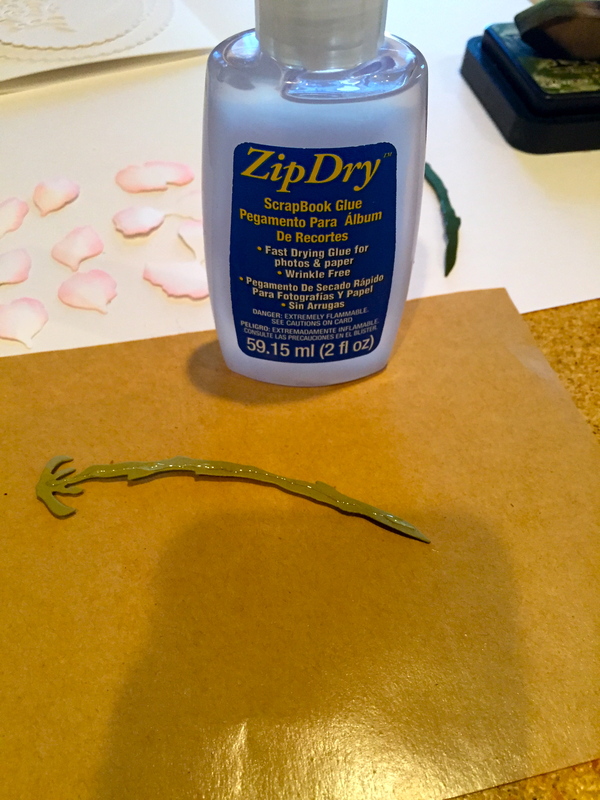 I use Beacon’s Zip Dry glue to run a bead down the (lighter green) stem. Then, set the darker green stem on top. The glue dries quickly! I shade the stem and the leaves with some Distress Ink/Forest Moss. 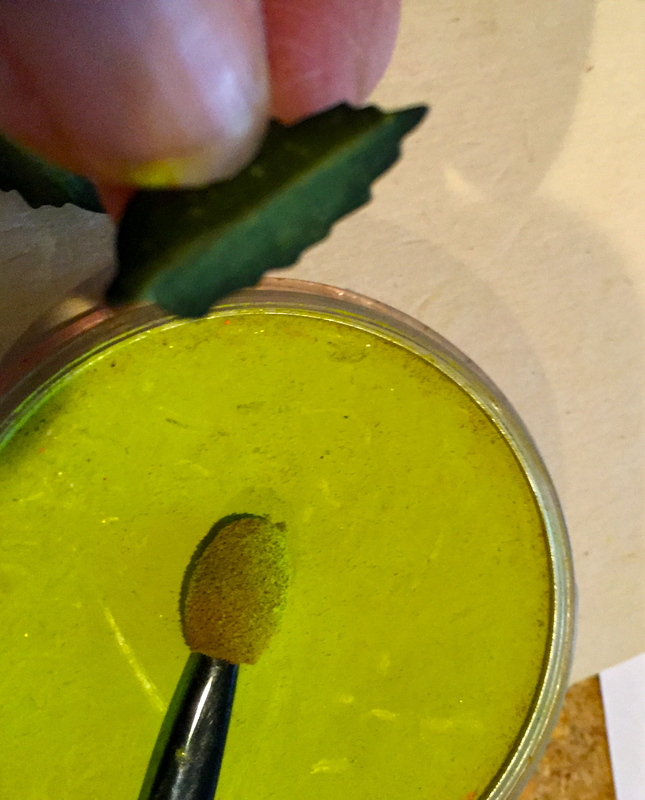 Use a toothpick with Beacon’s Kids Choice glue on the back of the stem and set in place directly on your project. (Garden Notes flowers are always constructed right on your project.) 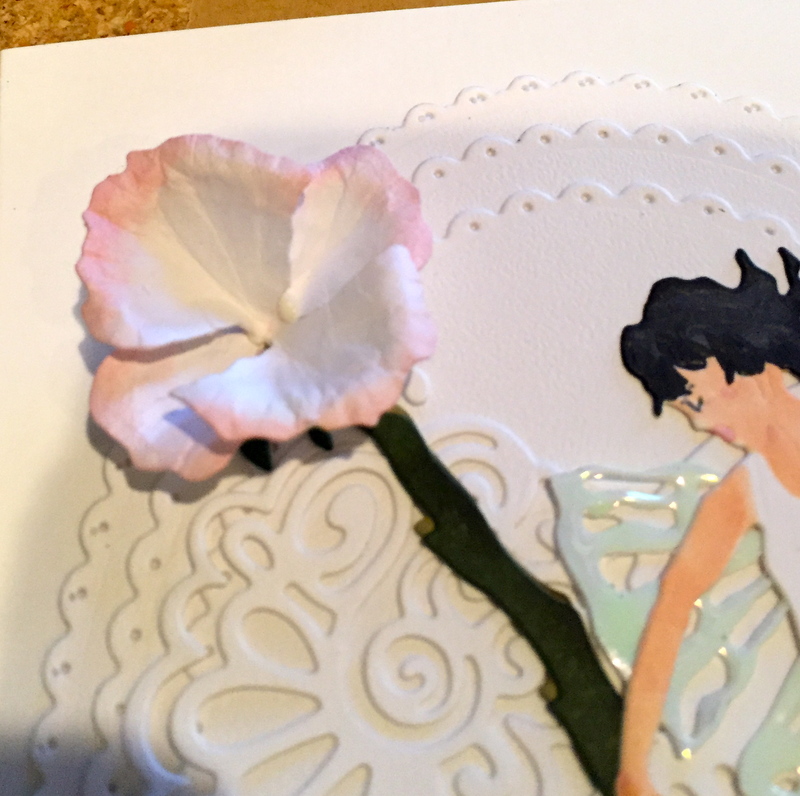 To create this card, I used Els van de Burgt Studio Dotted Scallop Ovals, Corners 1 and ModaScrap Lace Heart, then I colored my Fairy and placed her on the card. 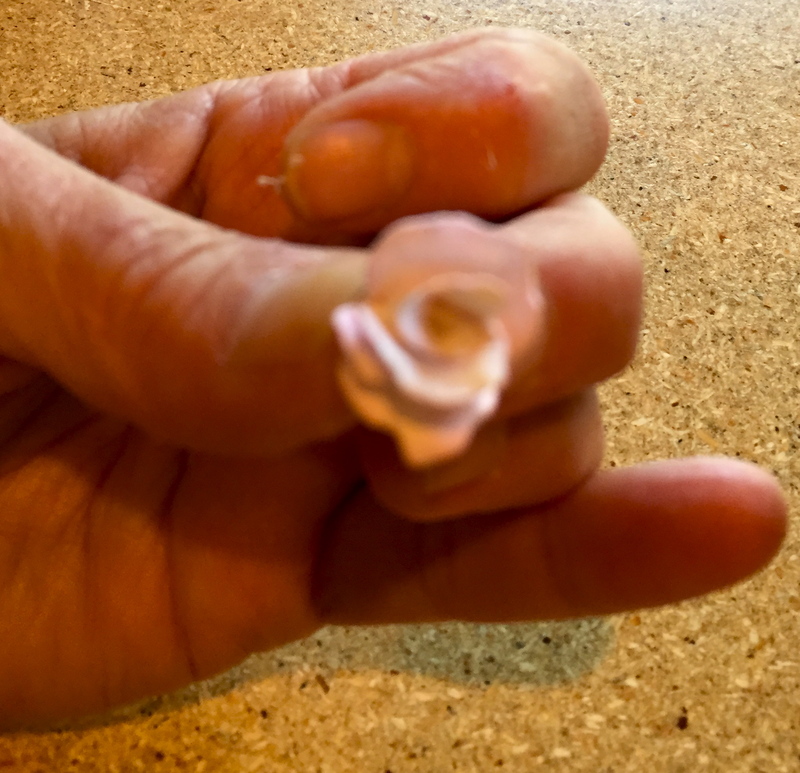 The Rose stem was set in place. 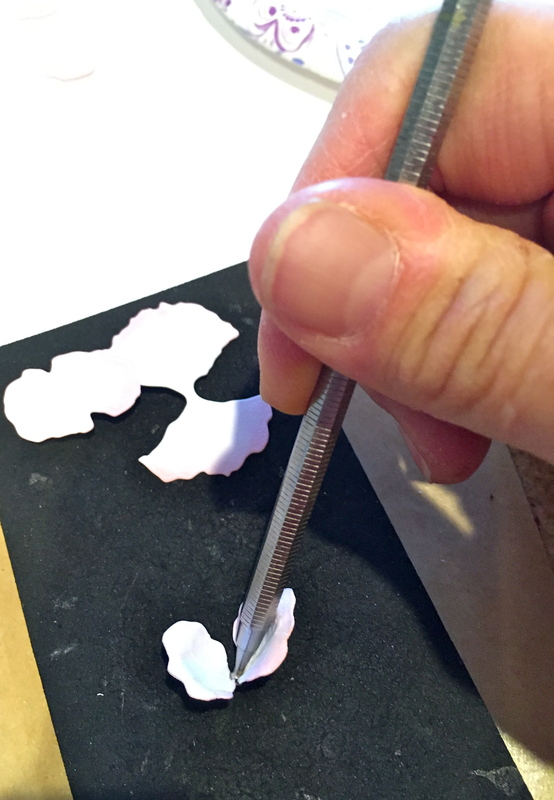 Place the “2-petal” piece on the Molding Mat and use the Small Loop tool to shape. 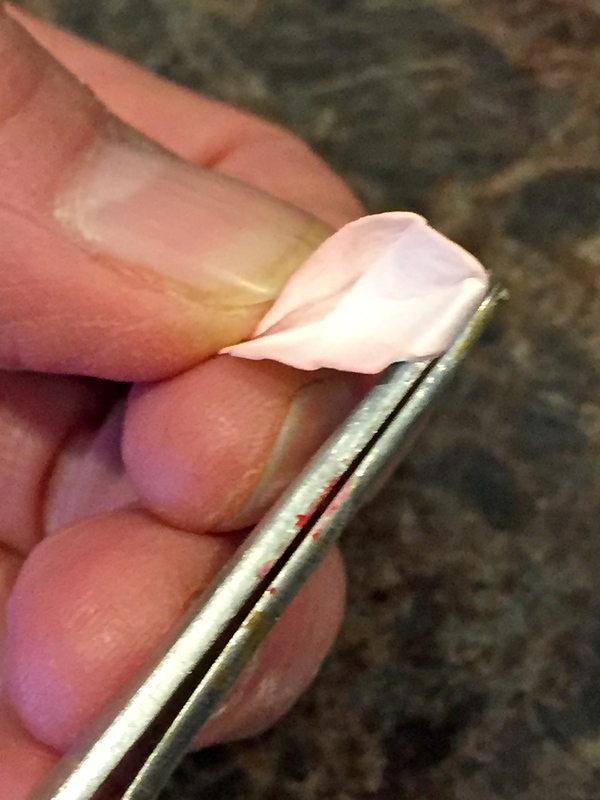 Next, I use my tweezers and pinch through the center. 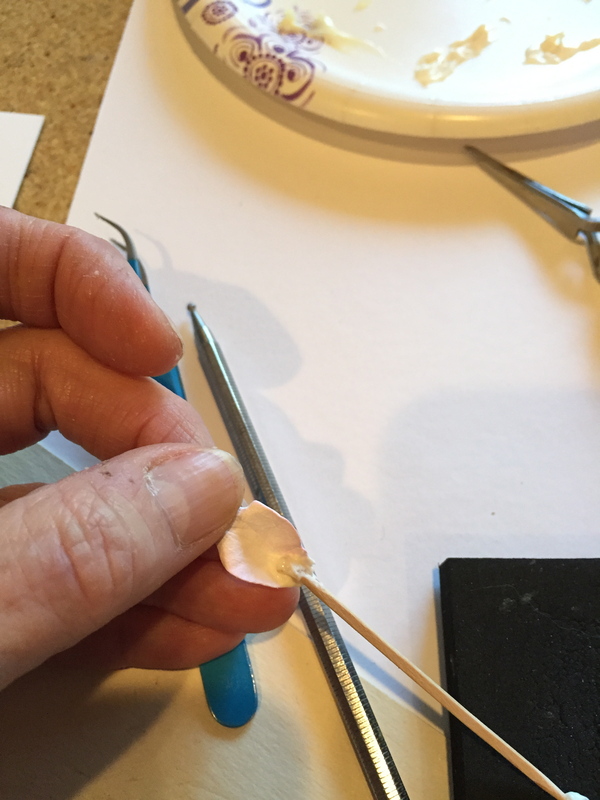 Use your thumb and index finger on your opposite hand to hold this pinch, while you release the tweezers. 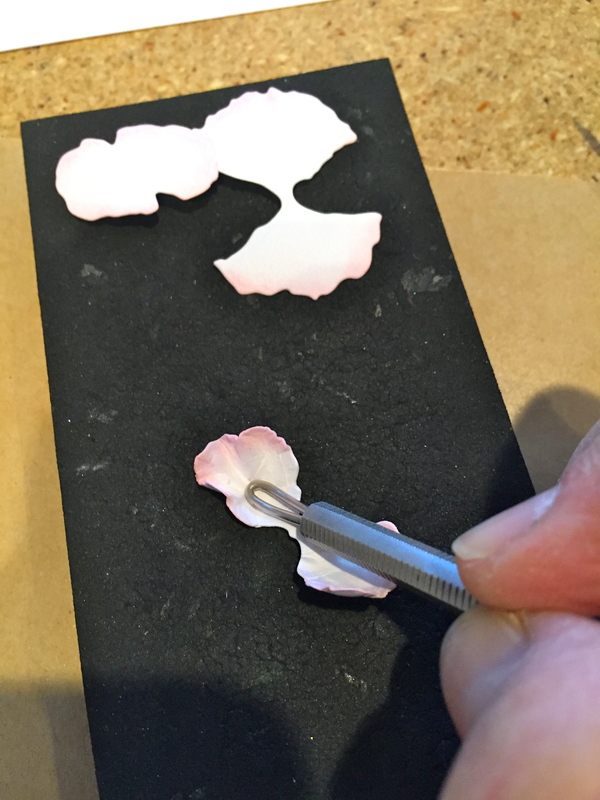 Continue to hold the “pinch” and use the tweezers to bend the edges of each petal downward. 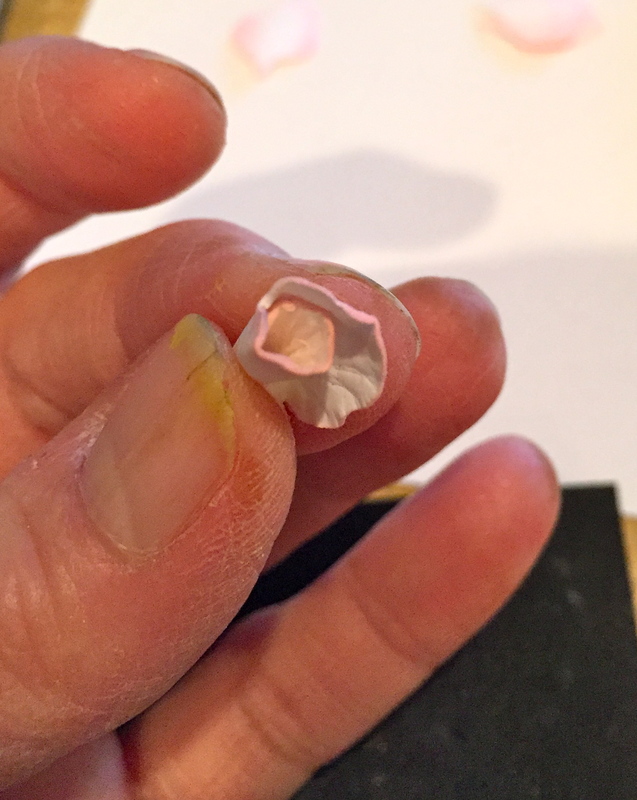 Finally, place this piece back on the Molding Mat and use the Small Ball Stylus to cup the center. 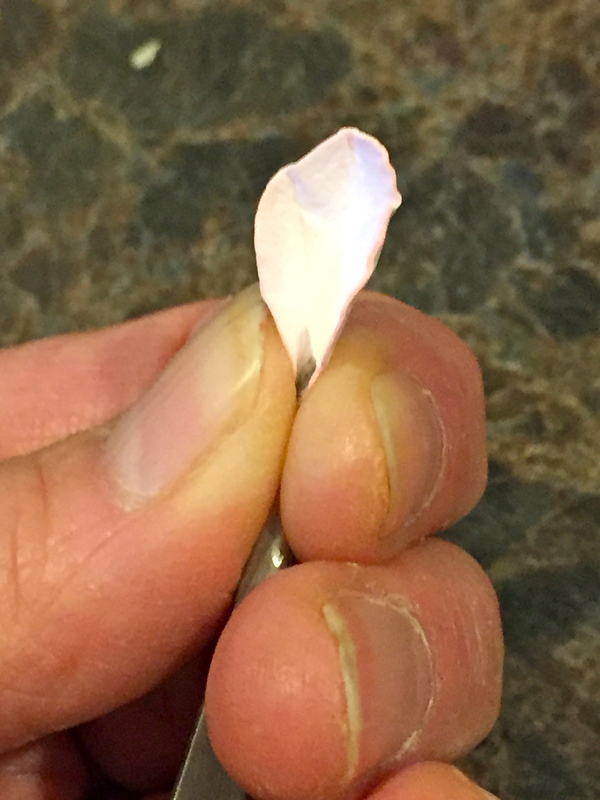 Use a toothpick to apply glue to the underside of the center and adhere it to the top of the stem (calyx). 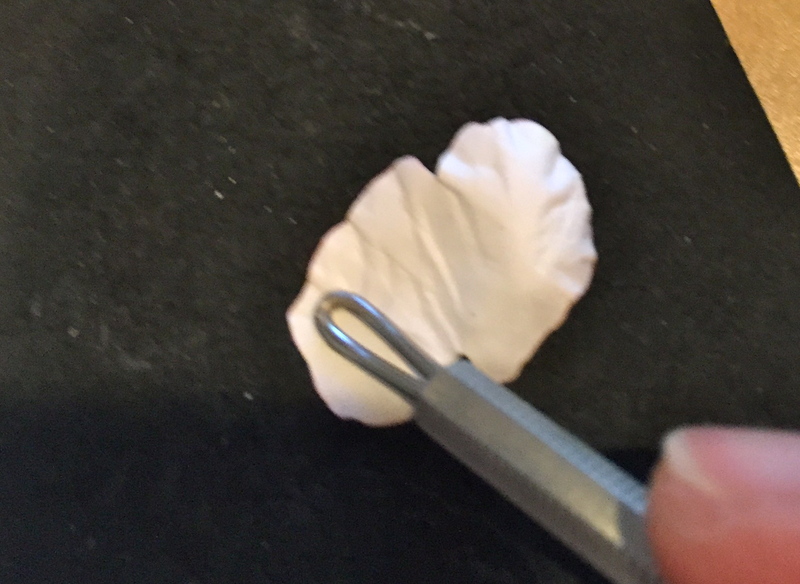 The next 2-petal piece is larger and shaping it is a little different. 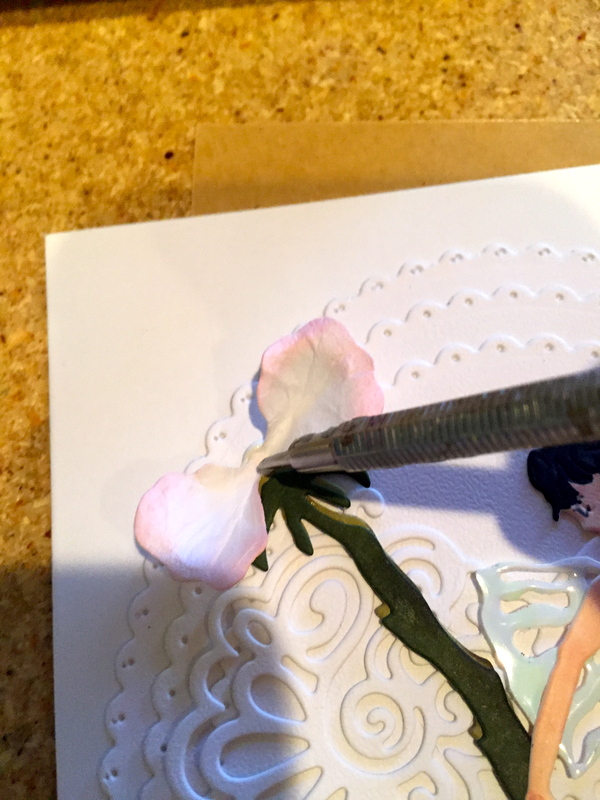 Place this piece right-side down on the Molding Mat and using the Small Ball Stylus, shape just the outer edges of the petal (both ends). 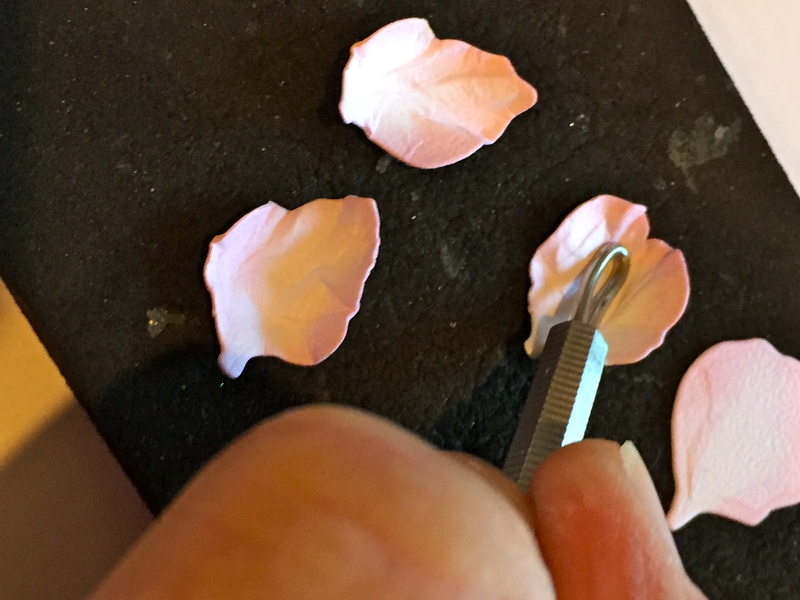 Next, turn the piece over and shape the remaining petal, starting below where you shaped on the wrong side. Repeat the pinching and bending techniques as you did above. Then, place back on the Molding Mat and cup the center. 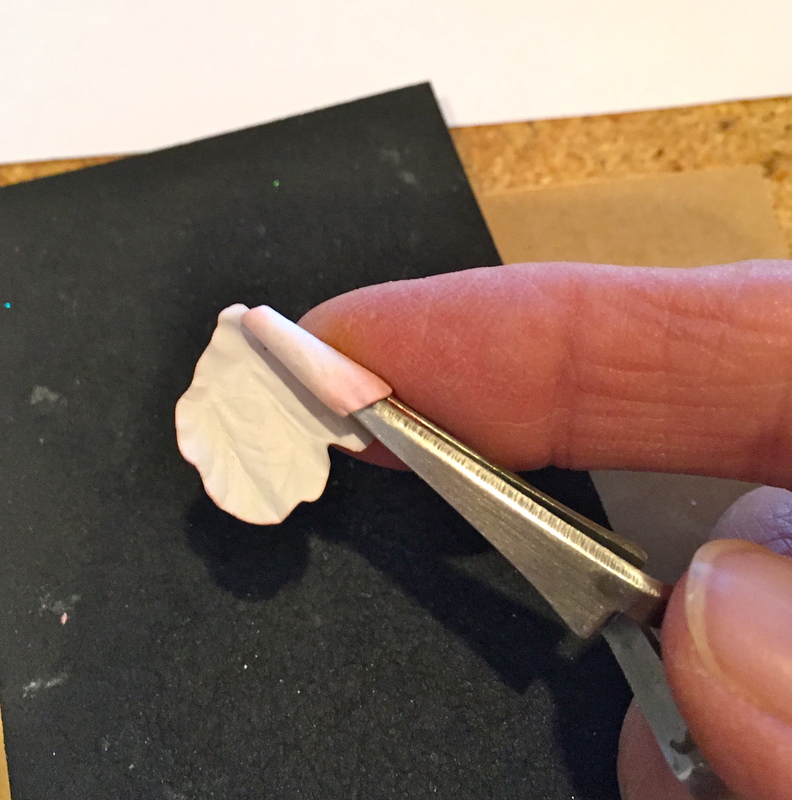 Use a toothpick to add glue to the underside center, then, adhere it to the flower–larger shape goes at the top. 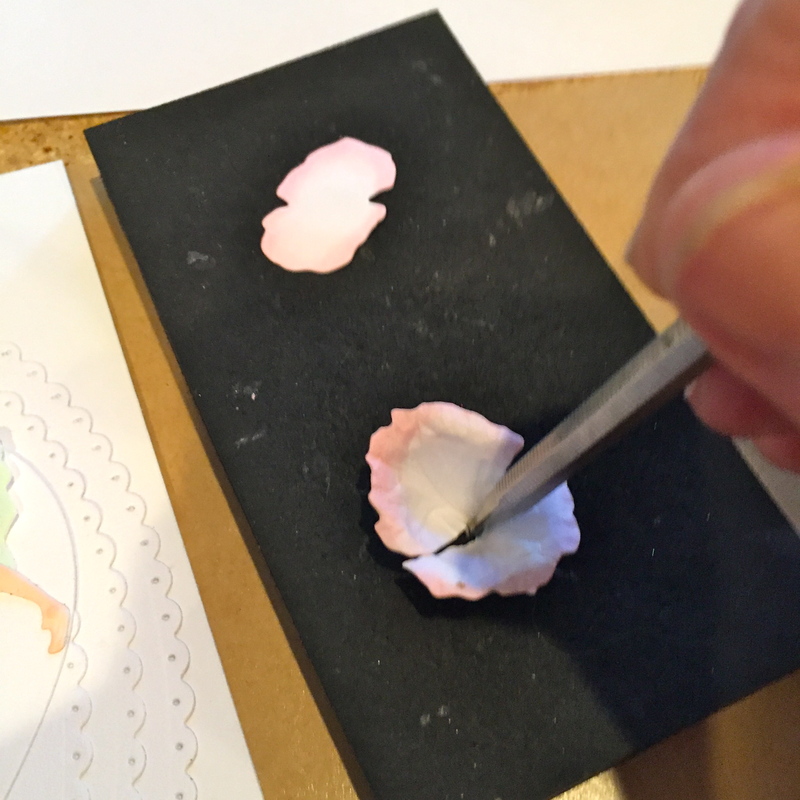 The Bud is the center and is created next so the remaining six single petals can be built around it.Place the bud on the Molding Mat, right-side up, and shape it using the Small Loop tool. Turn it over, with wrong side up, and repeat the same shaping. With the bud upside down, use the tweezers to grasp the right side and roll towards the other side. 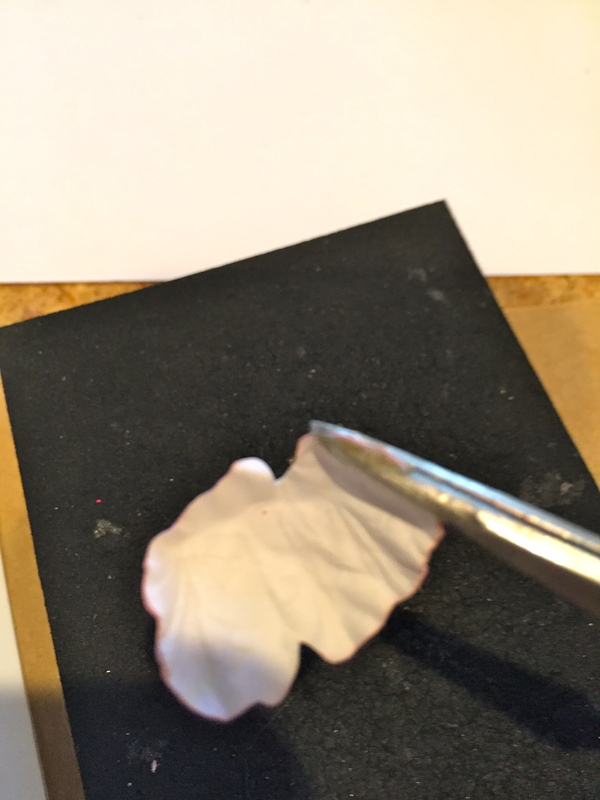 Use a toothpick to apply a small amount of glue at the “stem” end and roll the shape closed. 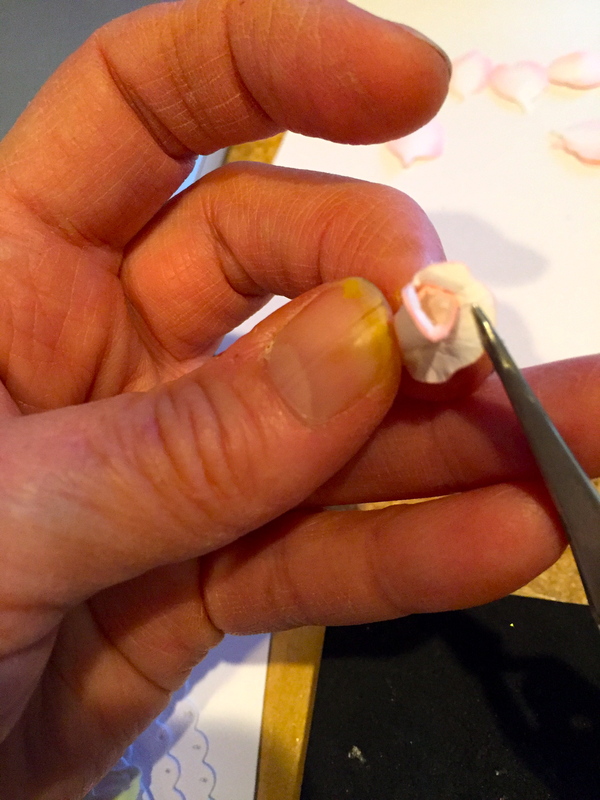 Slide the tweezers out, holding onto the rolled bud with your opposite thumb and index finger. 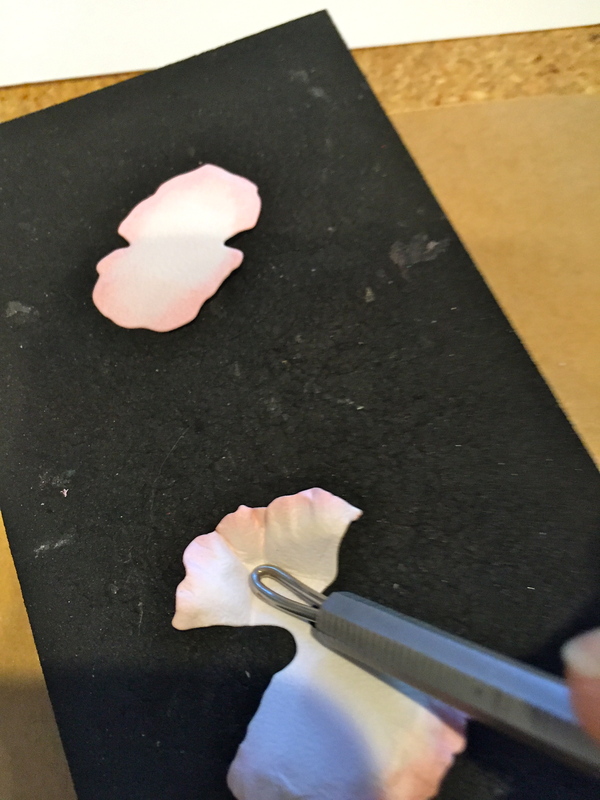 Use your tweezers to bend out the bud edges, slightly. 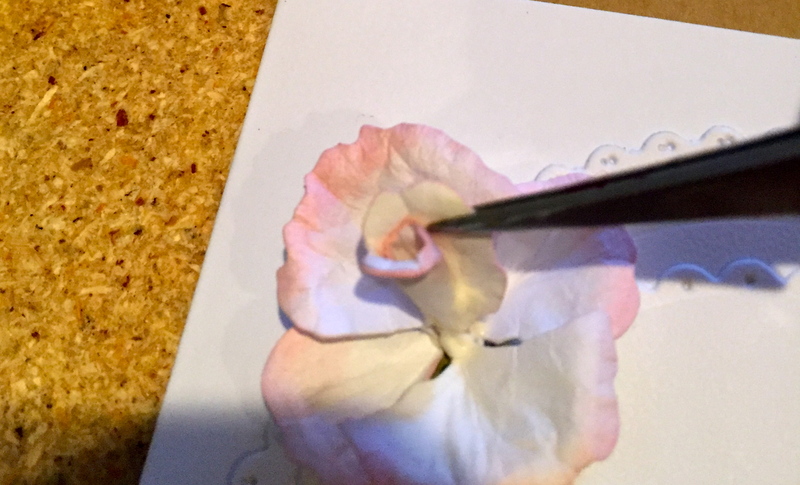 You can dip the stem end of the bud into the glue and set it in place in the center of the petals. I prefer my bud to lean slightly towards the back petal rather than stand erect. 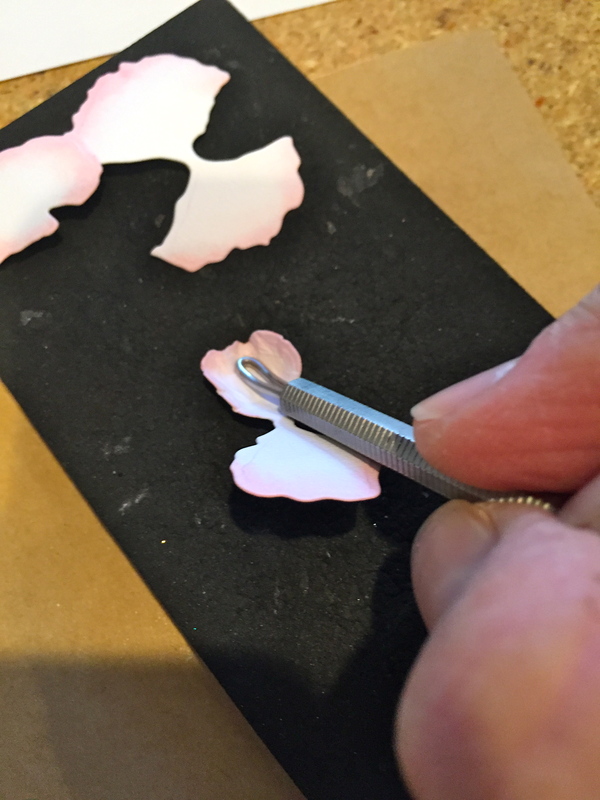 Place the remaining 6 petals on the Molding Mat and shape, pinch, and bend each one. 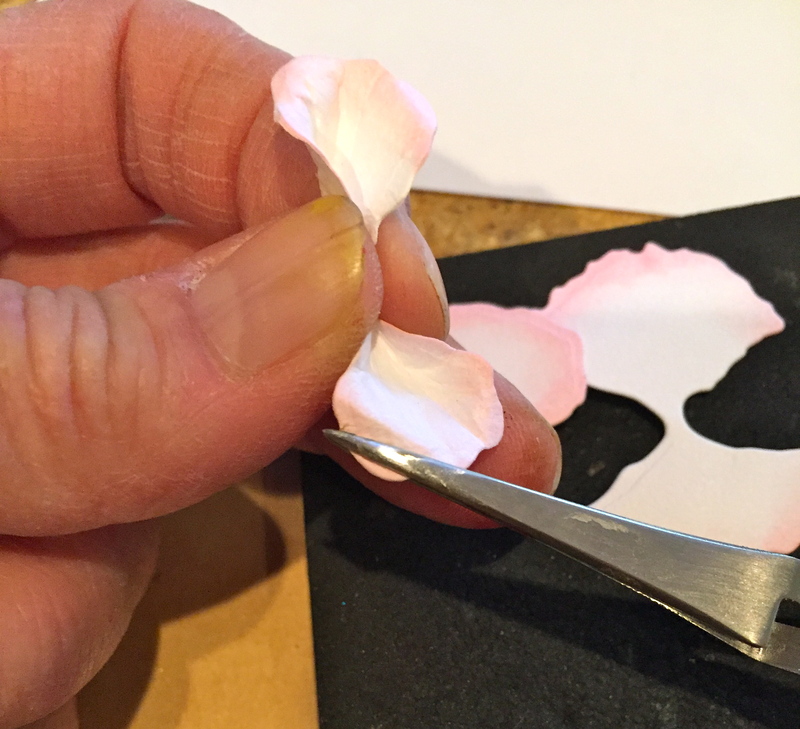 Build the rose from the center outward with these petals. If you want to add a “new bud” to the side of your stem. 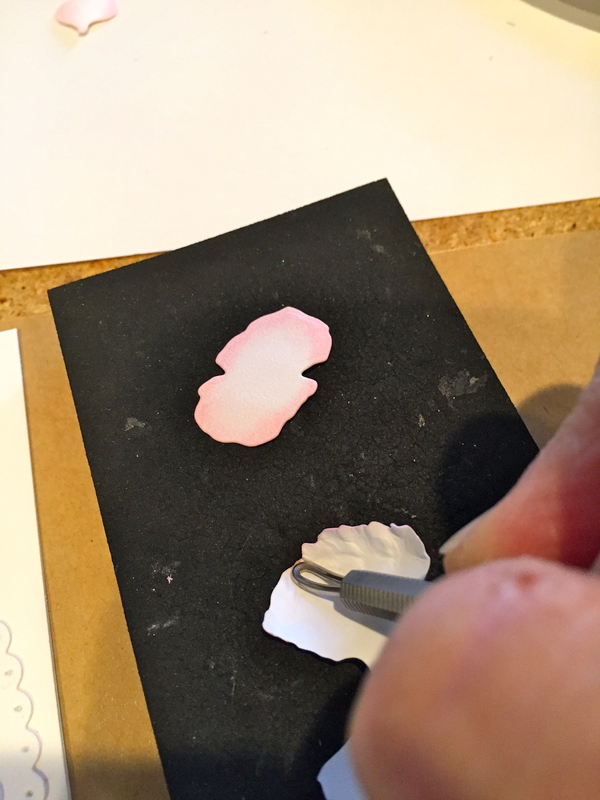 Die cut the bud and 3 petals. Repeat the techniques used above. 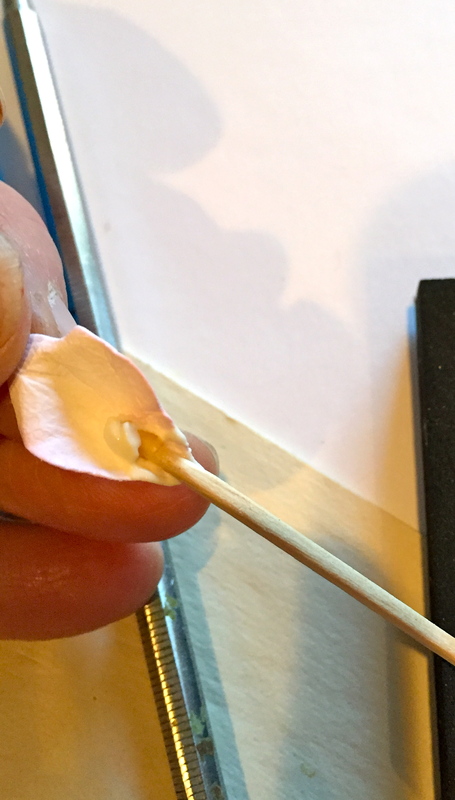 I use a toothpick to apply a small amount of glue to the inside of the stem end of the petal to construct this bud. 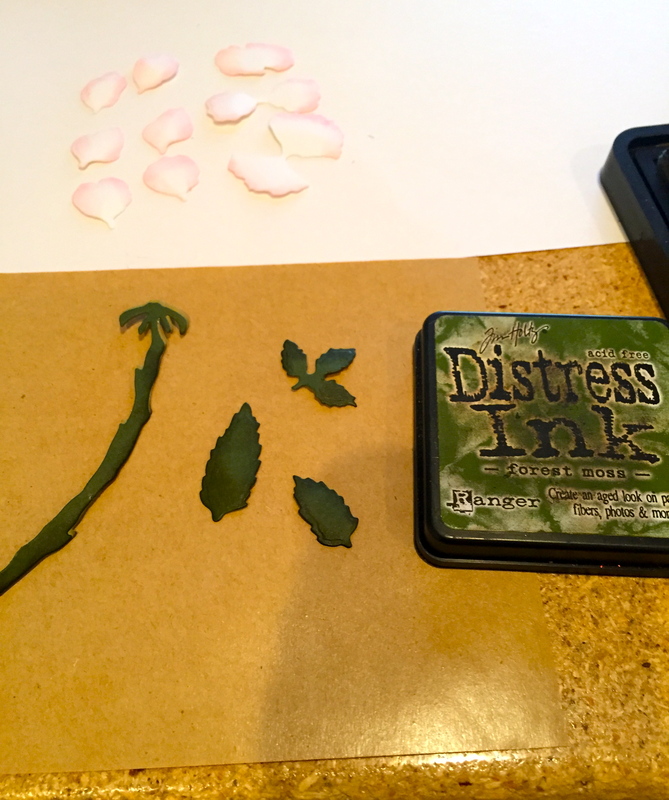 Leaves are shaded with Distress Ink/Mossy Green, then use the Leaf Tool with the piece, right side down, on the Leaf Pad and stem. Turn over and bend along that stem line and shade with PanPastel/Bright Yellow Green. 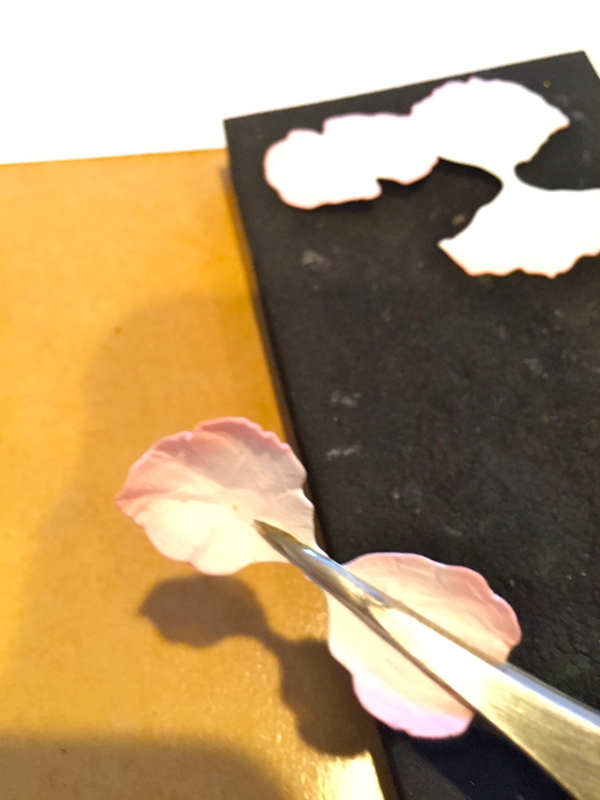 Place back on the Leaf Pad and use the Leaf Tool to create veins. 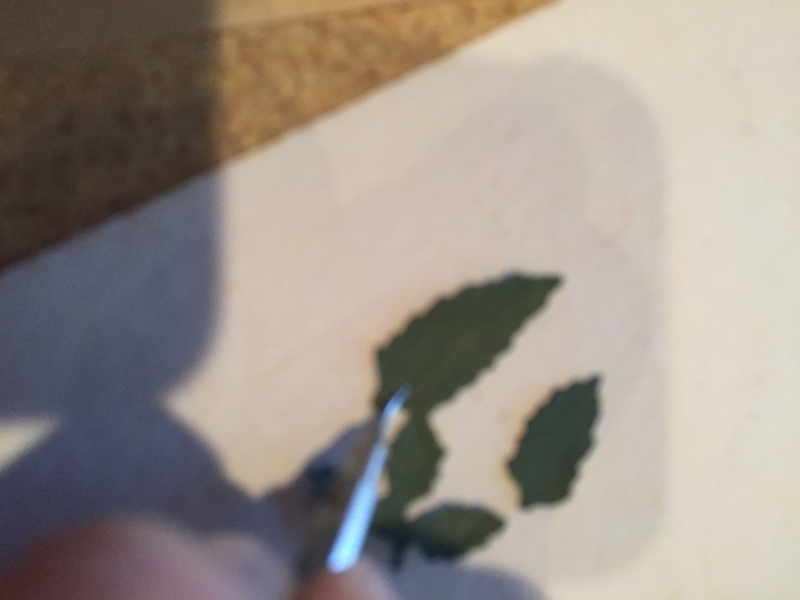 Pinch the stem end and bend down on the Leaf; dip stem end into the glue and set on the stem. 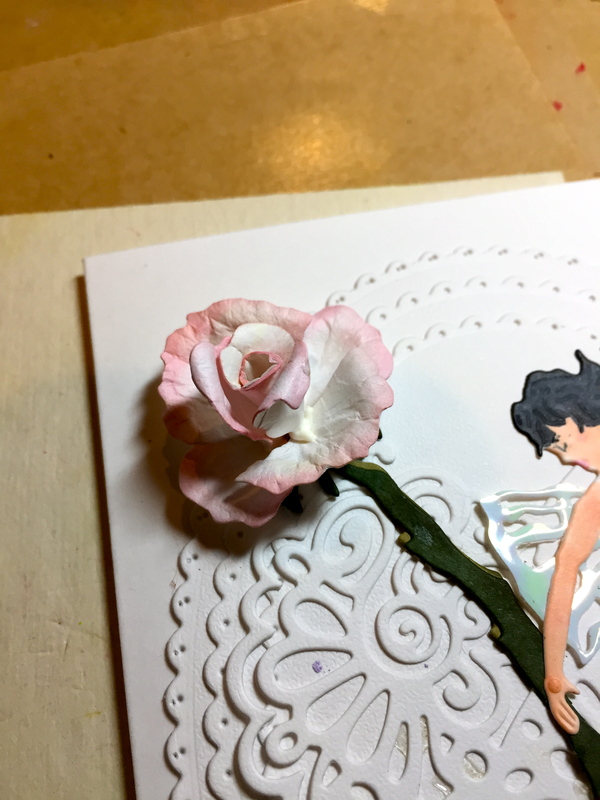 I created the Fairies “tutu” using the same techniques for those petals as I did for the Rose. Her wings are die cut in Shimmer Sheetz. 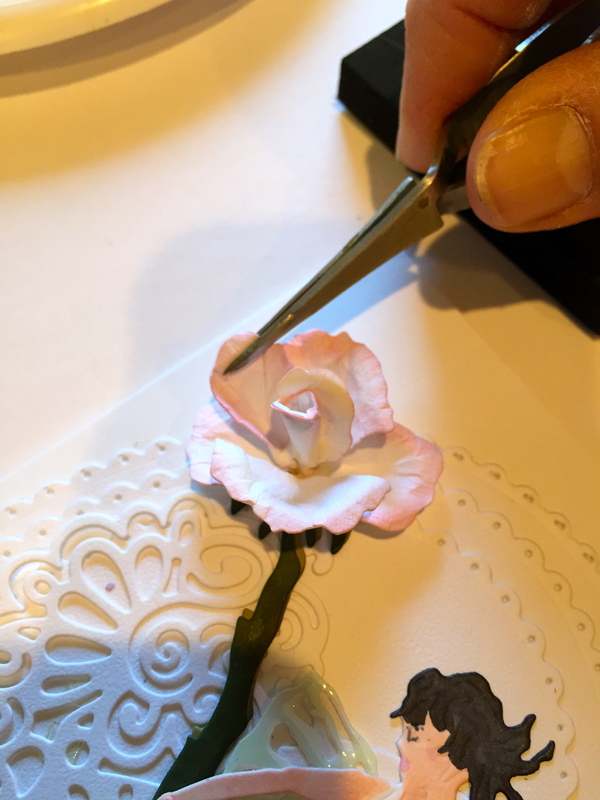 I love making these Roses and hope you will too. Remember, if you have any problems, you can email or IM me on Facebook and I promise to answer all your questions. Happy Gardening! Beautiful! The bud is my favorite. Colors are GORGEOUS!